One of my favorite parts about reading is being able to explore new perspectives and new places. Fantasy and Science Fiction also allow for the possibility to travel back in time to an alternate history where magical creatures exist or forward to the distance future when humans no longer do. 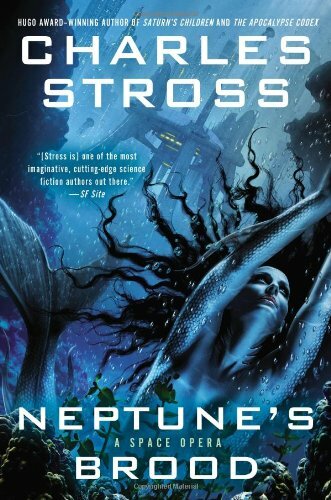 Charles Stross’s Neptune’s Brood is set thousands of years in the future when robots roam the universe to settle planets in honor of the dreams of their former creators. The short story collection Queen Victoria’s Book of Spells, in contrast takes the reader back to the Victorian Era, but imagines the world alive with ghosts, witches, and fairies. 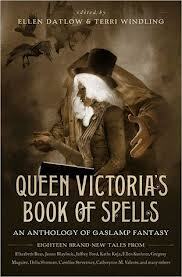 Queen Victoria’s Book of Spells edited by Ellen Datlow and Terri Windling contains a collection of fantasy short stories set in the Victorian and Edwardian period. While Gaslamp Fantasy often brings up visions of Steampunk, in these stories rather than featuring dashing airship pilots and clever female inventors, there tends to be a greater focus on historical accuracy, but slipping in some elements of (often dark) fantasy. The stories on the whole are much more interested in looking at the grittier aspects of life at the turn of the century and not simply the interesting inventions and costuming of the upper class. The book includes original stories written for the collection. I was familiar with some of the authors such as Gregory Maguire, Kathe Koja, and Tanith Lee, but I enjoyed majority of the stories in the book, even those of author’s I had never heard of. There is also a nice variety throughout; one story is told through historical documents (some real and some imaginary), another is told through letters written back and forth between two authors, and another is written in an atypical second person perspective. In two cases the stories expand on the lives of characters in period literature. Some of the highlights of the collection for me are: Jeffrey Ford‘s “The Fairy Enterprise”, Veronica Schanoes’s “Phosphorus”, and Catherynne M. Valente’s “We Without Us Were Shadows.” I was especially fond of the story from which the title is derived, Delia Sherman‘s “Queen Victoria’s Book of Spells.” I liked not only the stories themselves, but also the historic notes that many of the authors included detailing the true details behind their tales. This collection will appeal to historical fiction fans, even if they do not typically read fantasy stories. Neptune’s Brood by Charles Stross mixes hard science fiction with biting satire and a bit of mystery. Some scifi works can read almost like fantasy where the technology seems to work by magic as much as physics, but here Stross has creatively thought out and explained how even the smallest detail works. Neptune’s Brood is set in the same reality where humans have gone extinct as another Stross novel, Saturn’s Children, but much later in time and it is not necessary to read the previous novel to understand or enjoy this work. Krina Alizond-114 searches for her missing “sister” Ana who was “spawned” at the same time by their “mother” Sondra Alizond-1 onboard the floating starship New California. Sondra created her “daughters” in her image, but is by no means a loving mother, but instead had kept them as indentured servants, who are trained with specific areas of specialties that she deems useful such as Krina’s background in historical accounting. This is defiantly the most action packed book about financial practices that you will most likely ever read, though truthfully it is also the only fiction book I have encountered that does so in such depth. I found the beginning of the novel, when Krina takes a working passage on a spaceship designed like a traveling cathedral based on a religion revolving around resurrecting humanity, to be a bit slow moving, but once Count Rudi, a bat like robot pirate, shows up things pick up considerably. When Krina arrives at the Shin-Tethys, the water world where her sister was last seen, I couldn’t put the book down. Krina’s destination ends in a discovery that will change not only her life, but all of her society’s; her journey illuminates our own present.